The Canada Lynx is a lovely animal with very thick fur. It has many characteristics that are reflective of the feline known as the Bobcat. The coat offers colors of tan, silver, and black. The fur offers a look on the face that is similar to how a human man develops a beard. They are about twice the size of a domestic cat. They range in size from 18 to 24 pounds. There are 28 teeth in the mouth of the Canada Lynx. Four of them are extremely sharp canines. These sharp teeth are used to puncture their prey. They have teeth for chewing their food and turn their heads sideways as this do so. They have lots of nerve endings in their teeth. Many assume by the name that the Canada Lynx is the only place where they are found. While that is where most of them live, they are also located in Alaska and many other regions of the United States. They tend to stay within 100 yards of the tree line. It isn’t uncommon for them to move up to three miles per day in their home range as they look for food. The Canada Lynx is a very mysterious animal that enjoys being alone. However, there have been noted times where small groups of them are moving around with each other. They are quite territorial and leave behind strong scents to let others know that they have staked a claim there. They also move around mostly at night making them nocturnal. However, they are also known to be moving around during the daylight hours so you just never know. Many people are surprised to find them swimming due to the extreme cold in many of the areas where they live. The majority of the diet for the Canada Lynx is the Snowshoe Hare. In many areas this accounts for 97% of the food that they eat. The problem though is that this food source goes through periods of peaks and dips in its own population. When they can’t find them they will consume birds, fish, rodents and weak deer. They will also eat animal remains that other picky predators haven’t consumed. They usually only hunt every other day, and eat about 2 ½ pounds of food daily. They will ambush prey and then pounce on it. Their sharp teeth are able to pierce deep into them in an instant. They need to be able to take the prey down quickly as they don’t have very much stamina. 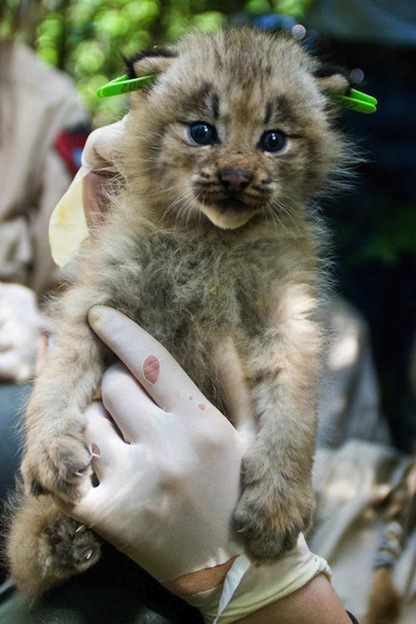 Breeding season for the Canada Lynx is from March until May. During that stretch of time the females will be in estrus cycle for up to five days. She will leave more markings and also vocally call for males to come mate with her. Each female will only mate with one male annually but males can do it with several females. The males will fight fiercely to be the one she is going to mate with. Just over two months later the young are going to arrive. The mother will prepare an indoor den for them so that they are warm and free from predators. There may be up to 8 young born at once. The mortality rate though can be as high as 95%. Even though the Canada Lynx has been hunted in many areas for its fur, it doesn’t seem to be at risk of being depleted. Some of the concerns for it though include the nature habitat being destroyed. In some areas the lack of the Snowshoe Hare can make survival tough. However, there are many years when the number of Canada Lynx increase and so they are still able to thrive out there in natural environments.